The unique heritage of African-Americans, presented here with imagination, humor, and wisdom, has tremendous value for students of cultural history, as well as to anyone who loves a good story well told. This recording features Ruby Dee, a member of the Theatre Hall of Fame and actress in A Raisin in the Sun on Broadway and Spike Lee's Do the Right Thing. Would you listen to Mules and Men again? Why? I'd listen to it again in order to remember some of those "lies". The origin of the word "um hmm." Who was the most memorable character of Mules and Men and why? Wish my father was alive to listen with me. Well worth the listen Ruby Dee is amazing and the stories are an insightful and delightful look into African American culture. Read/hear more of Zora Hurston's writing. You'll learn something new every time. This is not the full book. I bought this audio book for a class I am taking, since my reading load is heavy and I thought an audio book would be a nice change of pace. When I went to do the homework assignment I realized that there were parts of the book I completely missed, so I looked at a hard copy and realized the audio tape cut out almost 1/3 of the book! This would be fine if Audible made it very clear that this is an abridged version. I cannot find a single indication on Audible that this is the abridged version. Is that even legal? I would not have bothered with the audio tape if I had realized it wasn’t the unabridged version. 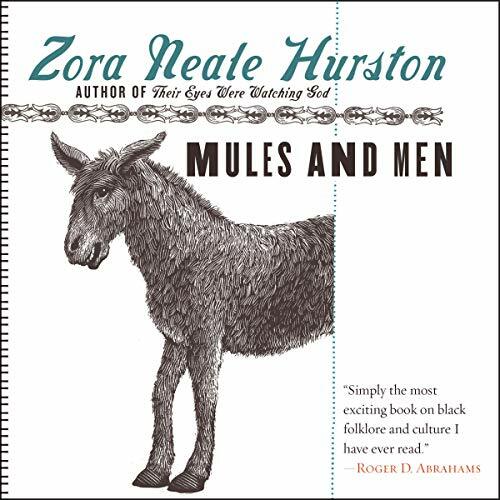 I feel bad for everyone who thinks they’ve read Mules and Men but have only read 2/3 of the book. I’m going to reach out to audible to see if they can post somewhere that it’s abridged. If it’s already posted somewhere they need to make it a lot more obvious. I thought it was beautifully written and Ruby Dee Rest in Peace was the best choice for this narrative. Simply amazing! Creative and hilarious. It’s so intriguing how her southern black experience with Black tales and folklore transcend time and space to remain relevant to my own upbringing decades later in Detroit. Ruby Dee’s narration was phenomenal as always. A great read!!! Ruby Dee really puts you there, With her voice inflections.Wonderfully done!!!! Love it!!! I enjoyed this audio book. Rudy Dee was amazing. I wish, however, that it was unabridged! Great narration. The stories remind me of my uncles and aunts. Very entertaining. Excellent writing. Highly recommend! Big Ben Sixteen my favorite!